Made with premium ingredients including fruit and chocolate, this fabulous range of muffins from Tip Top Foodservice has been snap-frozen immediately upon baking to preserve freshness and that “freshly baked” look, ensuring consistent quality. 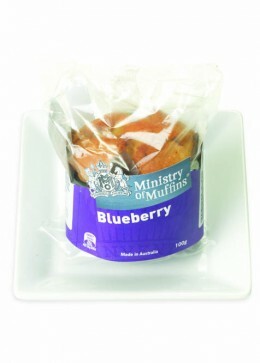 Ministry of Muffins muffins are available in 100g (72 per carton or individually wrapped 36 per carton), or 25g (96 muffins per carton). Varieties include Double Chocolate with rich chocolate chips, Blueberry (made with real blueberries), and Banana & Oat (fluffy and light, made with real banana for a natural golden colour, and topped with oats). And with Ministry of Muffins there’s no wasted product – simply thaw the muffins you need and keep the rest frozen until required.